Psychopath. The word alone evokes powerful emotions and images. 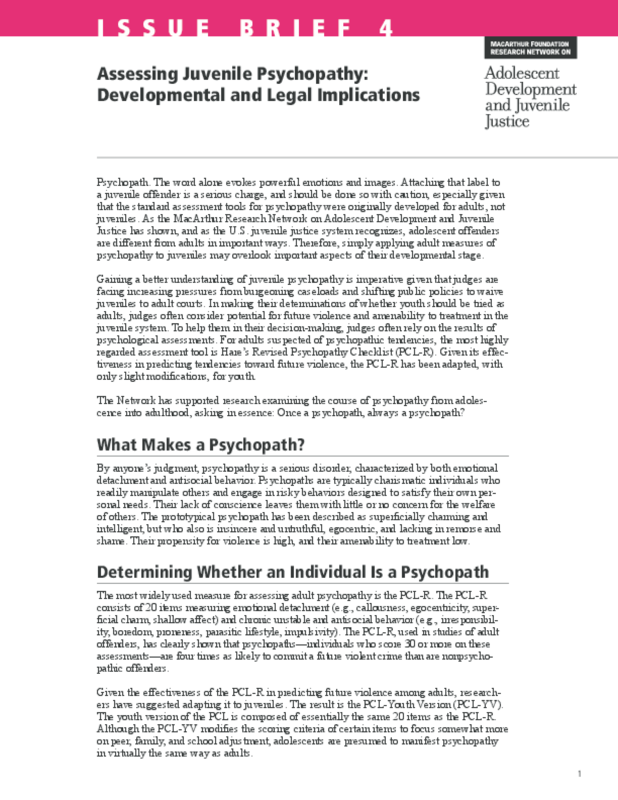 Attaching that label to a juvenile offender is a serious charge, and should be done so with caution, especially given that the standard assessment tools for psychopathy were originally developed for adults, not juveniles. As the MacArthur Research Network on Adolescent Development and Juvenile Justice has shown, and as the U.S. juvenile justice system recognizes, adolescent offenders are different from adults in important ways. Therefore, simply applying adult measures of psychopathy to juveniles may overlook important aspects of their developmental stage. The Network has supported research examining the course of psychopathy from adolescent into adulthood, asking in essence: Once a psychopath, always a psychopath? Copyright 2006 MacArthur Foundation Research Network on Adolescent Development and Juvenile Justice. All rights reserved.